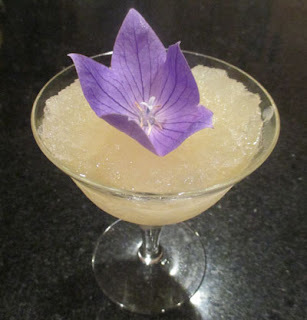 The theme for this month's Mixology Monday (MxMo XCIX) was picked by the Muse of Doom of the Feu de Vie blog. The theme she chose was "Ice, Ice Baby!" which seemed like a great theme given the rather hot weather. The Muse elaborated on the concept by describing, "And in all this time there hasn’t once been a theme dedicated to that undersung-yet-essential part of nearly any cocktail: ICE. The word says it all. Big ice cubes for Old Fashioneds, pellet ice for juleps and cobblers, shaved ice for adult snowcones, crushed ice molded into a cone for a classic Navy Grog. The art of the blender. Tell us why your selected or invented cocktail needs this particular ice usage. Show us how to make perfectly clear ice at home or what you get to work with as a professional drink-slinger. It doesn't even have to be pure H2O, either. Flavor it up! Teas, juices, liqueurs, bitters, other frozen edible objects serving as ice. Tell us the nuances of a properly-made Il Palio. Show us why a decorative approach takes your recipe to the next level. Whatever tickles your taste buds and refreshes you this summer." I helped to schedule this event to sweet spot Tales of the Cocktail in the middle of the two week gap between announcement and due date to allow for greater participation. And during Tales of the Cocktail, the answer as to what to do for this theme came to me. At first I figured it was going to be from all of the crazy ice shells and drinks at Beachbum Berry's Latitude 29, but instead it came via Dave Arnold and Philip Duff's talk "Perfect Frozen Drinks: Science and Practice." While various recipes and formula for blender and snow cone drinks were offered, the aspect about how to design drinks for Daiquiri machines caught my attention. However, one ought not just throw a large batch of cocktail into one of those machines without doing two things: a bit of math and some small scale testing, otherwise a lot of product and time will probably be wasted. Drinks definitely do not convert the same from shaken to frozen, and I will cover that talk in greater detail in the next few days. No, my OXO measuring cups are not that accurate, and I decided to try to get close enough instead of getting out my scale and calculating weights by volume intended and density. After mixing, I stuck the bag into the freezer after pushing out most of the air bubbles, and it was ready when I got home after my long bar shift that night. I mashed up the contents in the bag slightly and spooned it into a chilled glass. Save for the garnish, the Frozen Periodista did not have too much aroma. While the sip was indeed lime, the swallow was soft apricot and orange notes. Overall, this frozen drink was pleasant but a bit light on flavor compared to the shaken version. Definitely a more flavorful rum would have helped here. Moreover, the ice crystals seemed a touch coarse, so I am not entirely sure if all my values were correct, or if this was the proper texture for an end result. So thank you to the Muse of Doom for picking the theme, getting a certain late 1980s song caught in my head, and running the show once again, and thanks to the rest of Mixology Monday for paying tribute to the unsung heroes of the cocktail with this event. Cheers!